There are some dishes that stay with you forever. 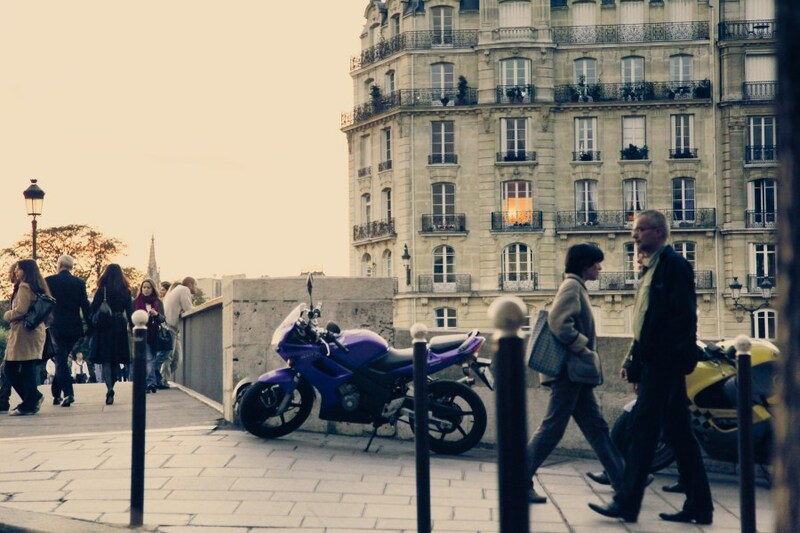 My mind is there right now: evening in Paris. Sitting on the patio of a corner bistro, watching people go by, hearing a street performer play an accordion in the distance, sipping a glass of wine and waiting for our meal to arrive. 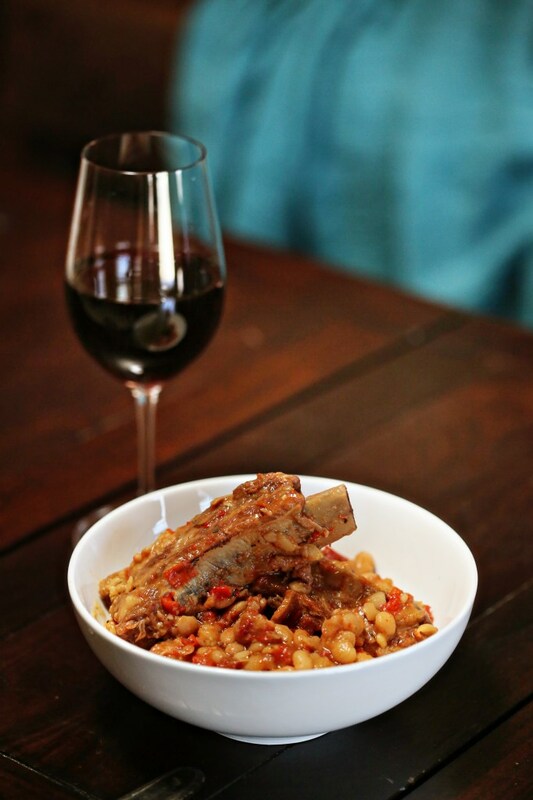 I ordered Cassoulet – a rich dish of slow braised sausages, duck confit, bacon, white beans and magic. Yes, magic. We had dozens of great meals in our two weeks in France, but this one, as humble as it might appear, was in my top 5. And that list includes a meal at the #11 restaurant in the world. I can’t explain the richness of this dish, the depth of flavor, the smokiness of the charred bacon, the sweetness of the sausages and the duck confit, which seems to be one of the most common menu items in France and the first real meal we ordered in France after our first day car wreck fiasco. Cassoulet is just a perfect representation of the love the French have for food and for sharing that love with others. When you taste this dish, you taste soul. It’s not simply a list of ingredients. It’s time, thought, care and enthusiasm for ingredients, all wrapped up into one, steamy bowl of goodness. Soak the beans overnight in enough water to cover them about 2 inches deep; drain and set aside. OR bring them to a boil for 2 minutes, remove from heat, cover and let stand for one hour. Season ribs with salt and pepper. Heat 1 tablespoon of the olive oil over medium-high heat in a large Dutch oven (a large stainless steal stock pot with a heavy bottom works, too). Add the ribs and cook, turning occasionally, until brown on all sides, about 10 minutes. Transfer the ribs to a plate. Cook the bacon in the pan until crisp. Transfer the bacon to paper towels to drain. Drain off all but 1 tablespoon of the fat from the pan. Add the bell pepper and onion and cook, stirring, until tender, about 5 minutes. Add the garlic and herbes de Provence and cook, stirring until fragrant, about 30 seconds. Remove the pan from the heat. Add the sherry and return the pan to the heat (this is to keep you from burning your eyebrows off, should the sherry decide to ignite on your stove.) Bring to a boil and boil, stirring to loosen all the good stuff from the bottom of the pan, until the sherry is reduced by half, about 1 minute. Add the beans, bacon, chicken broth, and drained tomatoes to the pan; top with the ribs. Bring to a boil. Reduce the heat, cover tightly and simmer for about 1 hour (the ribs won’t be done at this point). After the pot has been simmering for about 45 minutes, heat the remaining two teaspoons of olive oil in a medium-sized skillet over medium-high heat. Cook the sausage pieces, turning to brown evenly, for about 5 minutes (the sausage won’t be cooked through, but that’s okay). Add the sausage pieces to the pan, pushing them down into the stew so that they are fully submerged. Bring back to a boil. Reduce the heat, cover, and simmer until the sausage is cooked through, the ribs are nearly tender, and the beans are tender, about 15 minutes more. At this point, I went to Target with my mom and left the pot on the stove at the lowest setting. So it bubbled away for probably an extra hour, but not at a simmer. It just stayed warm. I really think you could do this if you made the dish too early or wanted to leave it on your stove for the afternoon, just staying warm. I think if anything, it just made the meat more tender. Uncover the pot and increase the heat so that the stew comes to an active simmer. Cook, stirring occasionally, until the liquid is reduced, the ribs are tender, and the stew has thickened, 10 to 15 minutes. Taste and adjust the seasonings. Serve in wide, shallow bowls, with a piece of sausage, a piece of pork and plenty of beans in each bowl. The Southerner in me made cornbread to serve with cold butter on the side to help soak up the extra juices. *almost word for word from page 200 of The Bonne Femme Cookbook, except, of course, the part about Target. This entry was posted in Weekend Fare. Bookmark the permalink. It is rare that you hear a picky eater (‘though, I don’t like being labeled) say this, but, this dish was simply amazing and even more enjoyable with the sweet cornbread. Hi! 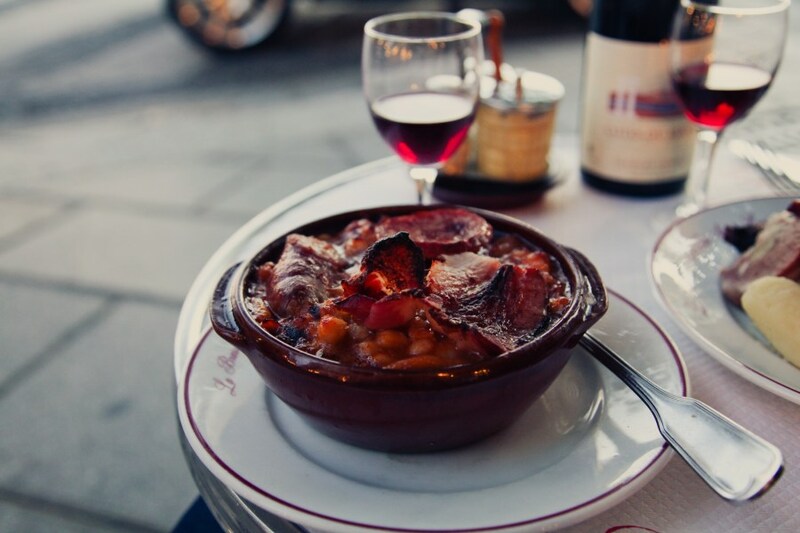 My husband and I ate the cassoulet at the same exact restaurant in Paris last year and it was amazing as you described! Now we are in Montpellier and I was searching for good cassoulet recipe and Voila! Here I am! Thank you for awesome photos and recipe! That is SO cool! I’m happy you shared this with me. Enjoy your time!